Subject: LongIsland.com - Your Name sent you Event details of "Suits for Sunrise! 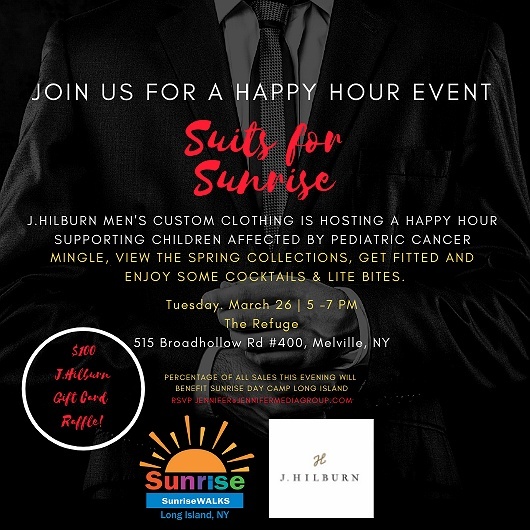 Cocktails, Men's Fashion, Give Back"
Join some of the top J.Hilburn stylists on Long Island to mingle, view our Spring Collections, Get Fitted all while enjoying some cocktails, lite bites and supporting SUNRISE DAY CAMP Long Island at one of the hottest Happy Hour restaurants on Long Island! Sunrise Day Camp Long Island supports Children with Cancer. A percentage of your purchase that evening will be donated to Sunrise. We will be raffling off $100 JHilburn Gift Card that can be used toward any custom purchase with one of our stylists. Meet some of J.Hilburn's top stylists, view and feel our new 2019 Spring Collections, bring a friend, have a cocktail and even get fitted for a custom shirt, suit or golf attire. This can be a great way to start elevating your personal style for work, play and weekends! All while giving back to a very special charity that is close to our hearts. J.Hilburn is the first direct sale and e-commerce custom men’s luxury apparel company, which is disrupting and redefining the men’s retail industry. Founded in 2007, and beginning with just custom shirts, we are now the only men’s custom clothing and lifestyle brand offering over 11 categories of custom clothing: shirts, sport coats and suit coats, trousers, chinos, 5 pockets, shorts, polos, tees, henleys, belts, and outerwear, including custom golf apparel. Sunrise Day Camp–Long Island is the world’s first full-summer day camp for children with cancer and their siblings, provided completely free of charge. The fun, friendship and smiles continue year round through various camp-like programs and in-hospital services.